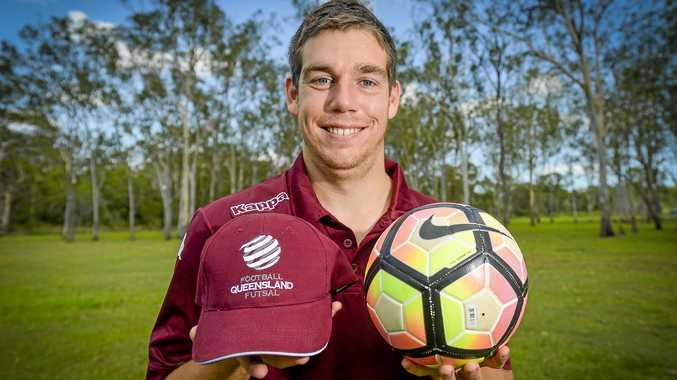 CALLIOPE man Adam Knust has been selected to represent Queensland at the National Futsal Championships in Sydney. The 26-year-old was called up after the state team was short of a player, with coaches remembering Knust after watching him in 2015. His mother Debbie Knust was so proud of her son's achievement. "He was very excited and accepted that selection,” she said. Adam feels honoured to be representing his home state, and is looking forward to playing with the team regardless of the result. "I don't care if I don't win. It's about being a part of the team,” he said. Adam also plays outdoor football and said those skills can be transferred to futsal. The game, also known as indoor football, is played on a hard court with five players, compared to the outdoor variant with 11 players. The pace of the matches are faster due to the smaller pitch and the slicker playing surface. After the tournament, Adam has dreams of aiming higher, not just in indoor football, but his sporting career in general. "One of my goals is to represent Australia,” he said. Matches are held between January 9-13, with Queensland's first match against South Australia on Wednesday at 12pm. Games can be streamed online at nationalfutsalchampionships .com.au.